a Texas Summer can bring with it brutal temps, add in getting caught in traffic and no way out I see temps spike and stay at 227 for long periods. I currently have clean inside and out stock radiators, new OEM thermostat, new OEM water pump, SAMCO Silicone radiator hoses and an 22lb rad cap that is holding pressure as designed, fresh 50/50 coolant mix. I have never "over heated" and boiled over, but have had it at the edge a lot this year so will be making some changes. GPI "racing" radiators use a different size temp sender then OEM, its a M14 x 1.5.|So I am using a Standard Motor Products TS288 Temp Sender/Sensor set at 195.8deg f. That is a two wire sender, vs the OEM 1 wire.. Easy fix, just make a ground wire for one terminal and run it to a near by ground point.. I will be adding a second threaded bung to the left rad for a second temp switch yet to be discovered, that will turn a second fan on at the left rad at about 210 deg f.
The idea being the second fan will only run in very hot coolant conditions like stop and go traffic in summer temps. Researching second switch now, once I find what I want I will machine a threaded bung for it and three tabs to mount the second fan, then have a trusted radiator shop weld the parts to the left hand radiator. Last edited by E.Marquez; 11-27-2018 at 06:01 AM. Are you running a 14bs (oversized) battery? That helped me along these lines. Stator Power is not an issue as this will only run the second fan with engine on...and there is more then enough watts available as I use all LED lights and no extras (heated gear) at the same time i will be running a second fan. Thats is the Napa catalog that gives data on the coolant switches. Late last month I installed the "racing" radiators commonly found on Ebay. Not a bolt on option for sure... The Fan took some mounting fabrication, the rad mounts took some fabrication,,, Stock hose lengths did not work, different size theomo switch was needed, and wiring changes as new switch was a two terminal, vice the single stock one.. Adding a ground wire was easy though. But I ended up with a SPAL 4" fan left over from a build. And it fits the space perfectly. What are the "ideal" and "highest acceptable" temperatures for this engine? I don't claim to know for sure..just personal observation and known data at when oil starts to break down. Last edited by E.Marquez; 07-23-2018 at 06:50 AM. Hey Erik good to see you finally pulled it off. You should see lower temps with this setup. You got pics of the whole spal fan thing? Thought about that too. I at one point for better cooling built a water misting system from an electric sprayer. It would spray water on the rad for extra cooling at critical times a la Porsche race cars. I wasn't happy with the results but it was a neat idea. I mocked up the fan with a spare set of radiators and left side faring I have. The 4" SPAL fits, where the OEM 6" fan did not. The issue is... the SPAL needs a fan shroud to be fully effective, and a fan shroud would lessen air flow when fan is not running. As Im not having overheating issues, only high temps in a few extreme situations I think I'll go without a shroud and accept the extra air it does me when at a stand still , and not significantly impact airflow when the bike is moving. In any case, second fan is on hold till new oil cooler is up and running. Been running it for a few years now (since my original rebuild with high comp pistons) and it works flawlessly. Another thing that would help would be to run Engine Ice coolant. Considered it, but did not want the additional failure points (clamps and such) slight addition that it is I realize..
Of course pretty much rock proof which is really nice so you can mount it in direct air stream. On this bike,,,I always figured it would absorb too much heat from the location it needed to be mounted at. As your still using yours and observed it helps..I guess not. Did you do other cooling system mods at the same time that might be the reason for lower observed temps?, or can you attribute the lower temps to just the aluminum inline splice cooler? This stuff always comes up but for supplemental cooling & no failure point I use this on the oil filter. Good amount of surface area and good airflow past it so I believe it helps. Based on design and location I can only see it helping or being neutral but it puts off quite a bit of heat. If you really want to get the max out of that, when you install it, use a slight smear of thermal heat sink paste. A $7 tube will give you enough for a life time of oil changes. 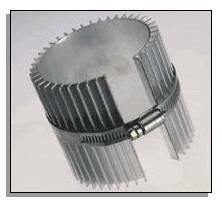 Id use one of these "heat sinks" if it was a full "cap" or cover ... as more of a protector for the oil filter that sits out in the open thinking it would be as you said, at worst a zero impact deal as far as heat retention / dissipation.